It’s no secret that we love the Beastie Boys. Ever since they graced our cover way back in 2004, they’ve been the only MCs to consistently overturn our strict non-coverage policy on Jewish White rappers. 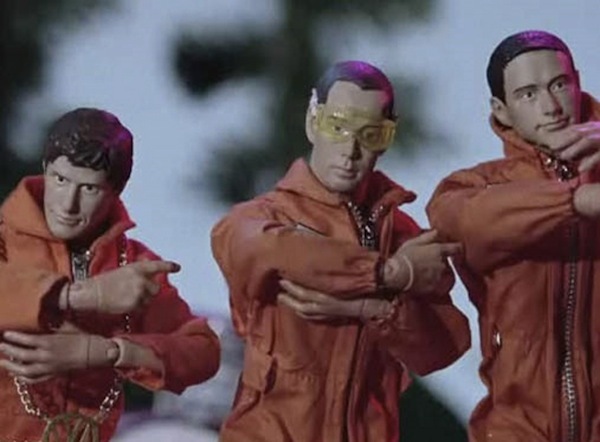 And yesterday, the team that brought us the timeless “Sabotage” video reunited for the new single and video for “Don’t Play No Game That I Can’t Win.” Director Spike Jonze employed a cast of action figures (including a black Barbie doll to portray guest vocalist Santigold) in an 11-minute short action film that’ll bring you back to childhood backyard war simulations. But the thing we truly love most about this video is that way back in 2004, during my interview with the MCA, Ad Rock, and Mike D, I mentioned how I’d been looking for the limited release A Bathing Ape/ Medicom Beastie Boy action figure package once released in 1998 to promote the Hello Nasty album (now selling on eBay for $1,500). Not two weeks later, after our chat, their management sent me a package of my own with the message inscribed on the box, “Stay Jewish,” and signed by them all. Inside were the very same collectibles now appearing in the video below. Except they didn’t come with Spike Jonze. Anyway, thanks for taking a stroll with me down Memory Lane. Enjoy the video. Love it. Thank you, Heeb magazine! Has it been 7 years?